I may have entered Argentina by plane, but my departure via the scenic bus ride from Mendoza to Santiago (Chile) was worth the extra transit time. 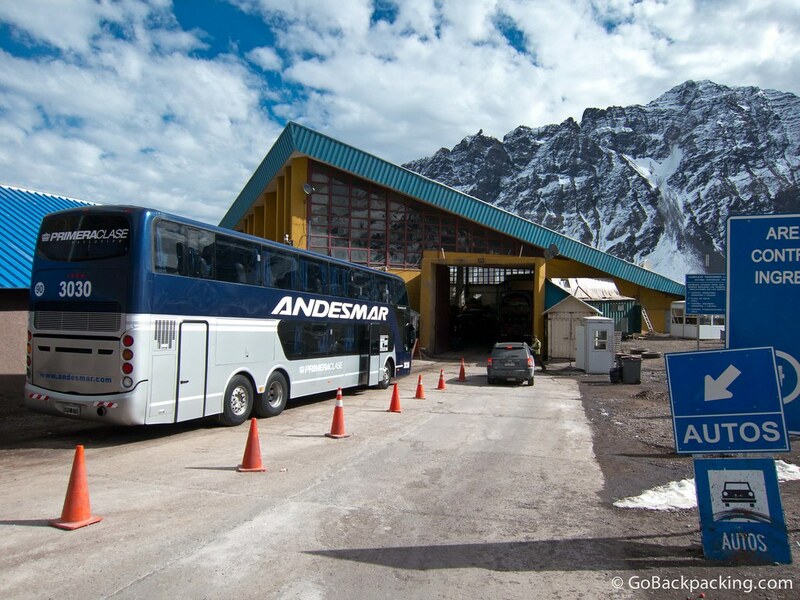 In Mendoza, I bought my bus ticket on Andesmar a few days in advance for just $35.90. By comparison, flights cost several hundred dollars, and you miss some of the most beautiful landscapes outside of Patagonia. The ride lated about 7 hours, including the time it takes to pass through Argentina and Chilean Immigration. 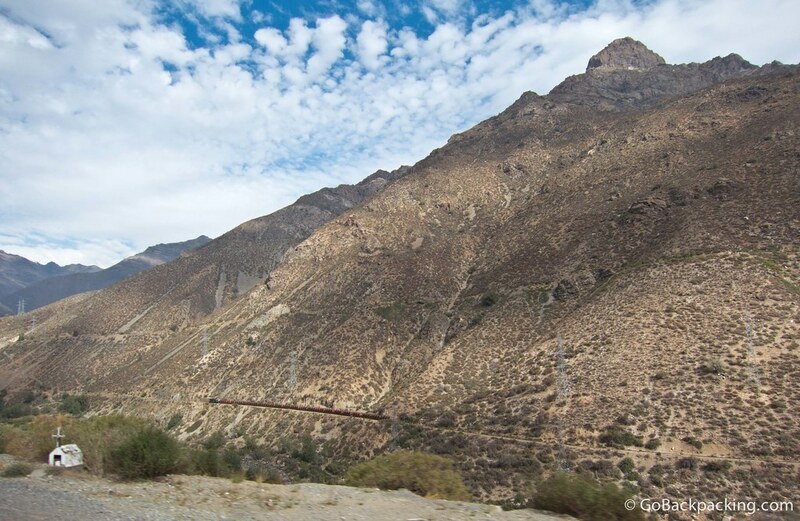 The highway passes by Puenta del Inca, but this natural geologic bridge can't be viewed from the bus. My photo below was taken a few days earlier on a separate tour. 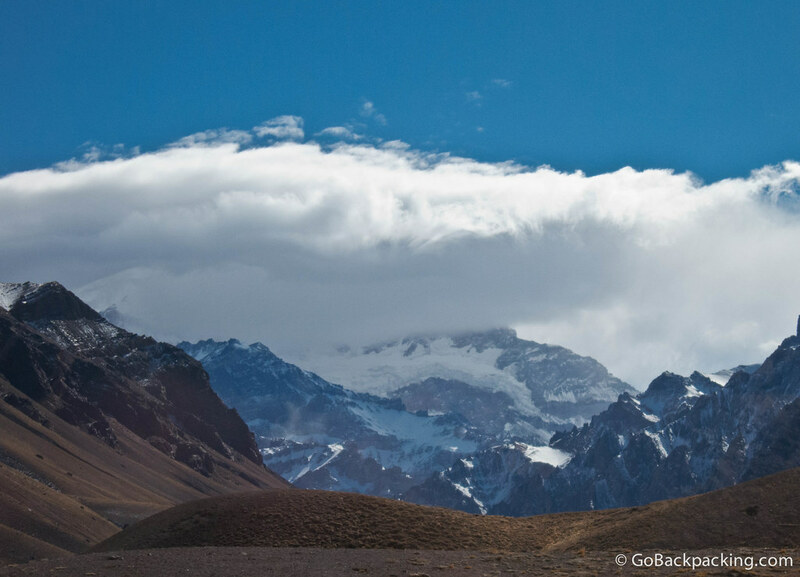 Another point of interest you can see from the bus, if only for a few seconds, is Aconcagua (6,960 m), South America's tallest mountain. I lucked out in that it was a beautiful, clear day. Thanks to the GPS on my iPhone, I was able to snap a photo of the cloud-shrouded peak as we passed it by. At times, the landscape looks more like Mars than Earth. An old railway line can be seen running alongside the road. 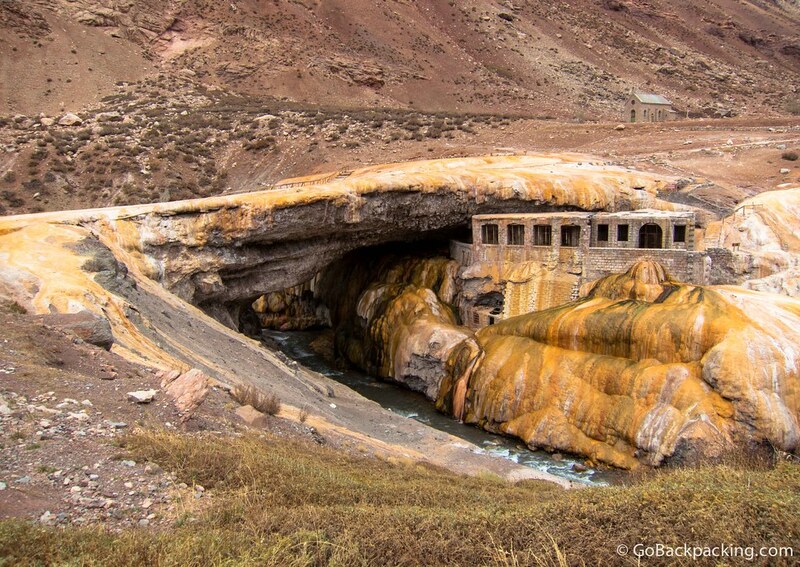 The Puenta del Inca is a natural geologic bridge once used by Incas to cross the river. In modern times, a spa was built under it to take advantage of the natural hot springs. 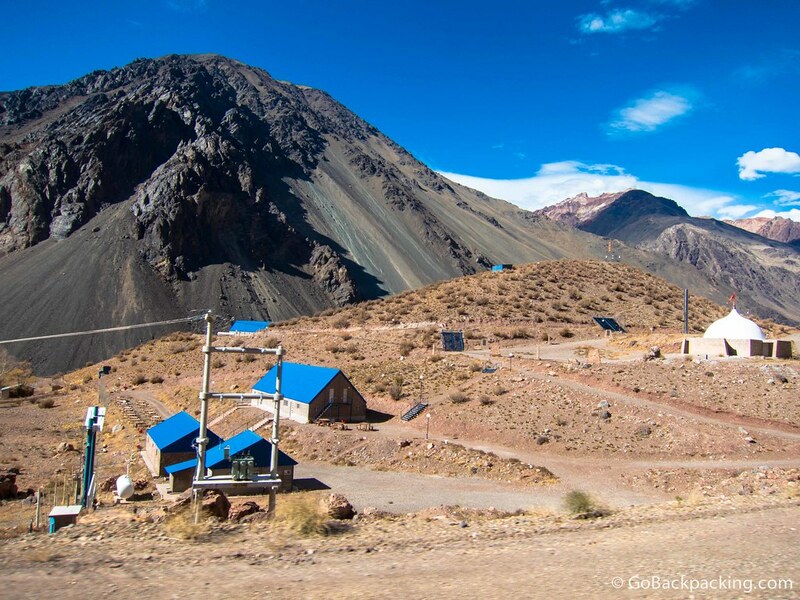 At 6,960 meters (22,837 feet), Aconcagua is South America's tallest mountain, as well as the tallest peak in both the Western and Southern hemispheres. Looking backwards at the mountain road, some sections of which are covered by a cement roof to protect against avalanches. A closer look at those turns! The remainder of the bus ride to Santiago isn't nearly as exciting. As the highway leads you to lower altitudes, the landscapes are mostly dry and scrubby. In this photo, you can see a red train making its way across the lower section of the mountain. Wow, that must’ve been quite a ride! Thanks for the correction about Neruda too. I’ll fix that reference in the Santiago article. Absolutely gorgeous! I would have been yelling at the bus driver to stop every five feet so that I could take a picture haha. Wow! Just looking at these pictures makes me feel dizzy! I guess in winter the landscape must look completely different. Out of this world! Those pictures are sooo cool especially the one with all the turns. Glad you were in a modern looking bus! your pictures are incredible. 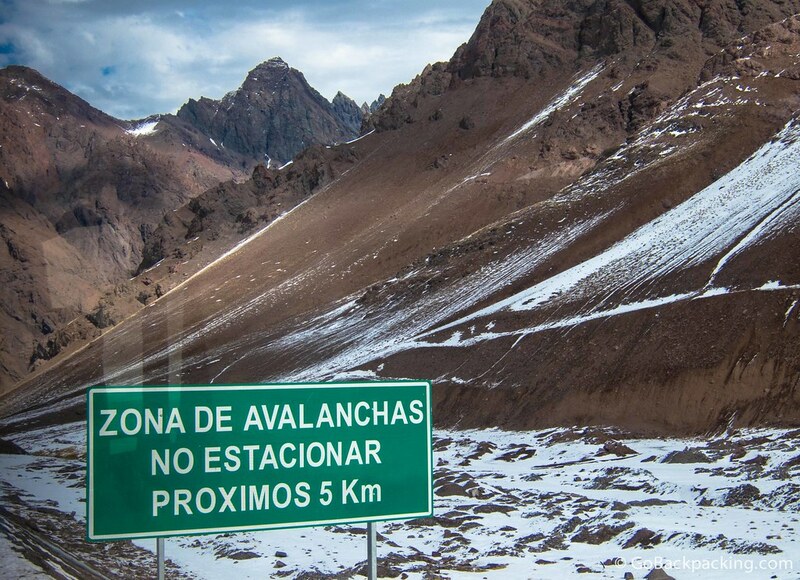 I wonder if there is a problem on this road when you have altitude sickness ? do you feel it in the bus ? Thanks Mady. No, I didn’t feel the altitude in the bus. Normally, a higher altitude is something you run into when when you’re exerting yourself physically, like walking or climbing up steps. Then you might feel a little out of breath. But sitting on the bus, you won’t feel any different. 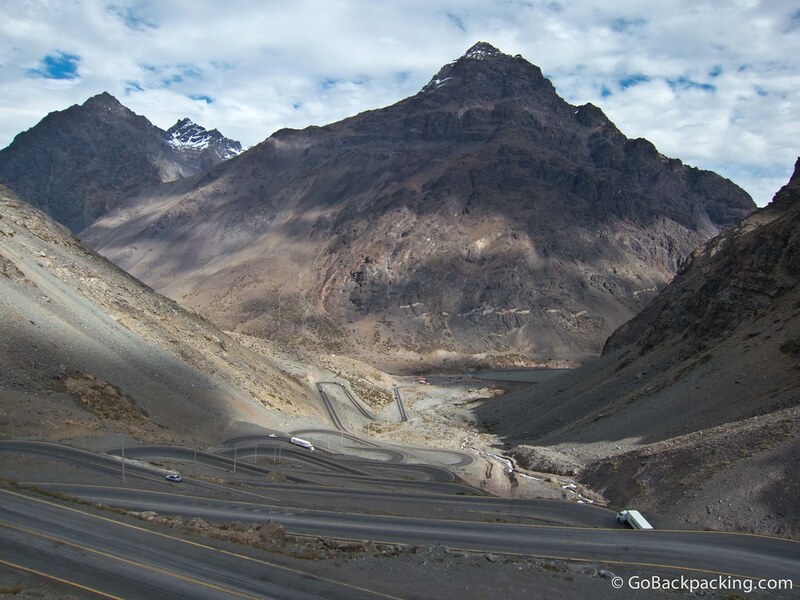 two bike riders has lost one pendrive with pics of his journey in Chile.The Facebook link to track the device and recover it: “Guanaco Verde Limon ” webpage. Good Luck ! The bus wasn’t full, so I was able to take photos out of both sides. Puenta del Inca cannot be seen from the highway (if I recall). I had gone there separately on a day trip before the bus ride. Hi Beth, thanks for reading. I took the bus May 20, 2012 and don’t recall having to pay anything upon entering Chile. The border process was quick and easy. Disembark, all luggage has to pass through a security check, get stamped out of Argentina, and stamped into Chile. I left Chile a few weeks later via a tour through the Bolivian salt flats, and didn’t have to pay anything on exit that I recall. It may only be you need to pay if you fly in/out versus crossing by land. Great, thanks for the information Dave! Great article. Biplane on doing this route soon. What are the buses like? Facilities? Stops etc? Beautiful! Thank you for sharing the amazing photos. I’m very excited to experience the hairpins myself in 3 months! just check your info regarding the bus rip from Santiago to Mendoza. Does the bus stop at any other point than at the border? No, the bus I took on this route did not stop aside from the border. It’s for transport, not tourism. 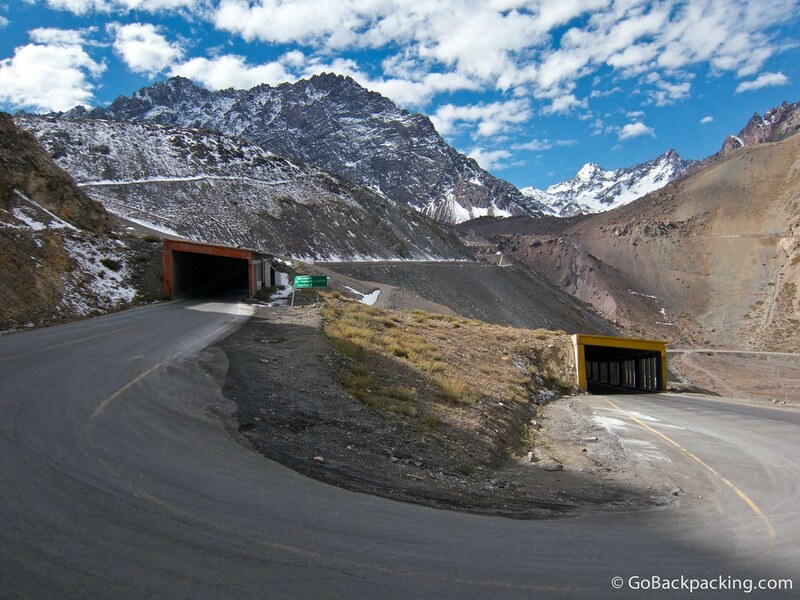 For this reason, I took a day tour beforehand from Mendoza which drove the same highway until the border. You need to do this if you want to see the Inca Bridge (which I recommend) as it’s not directly along the highway. 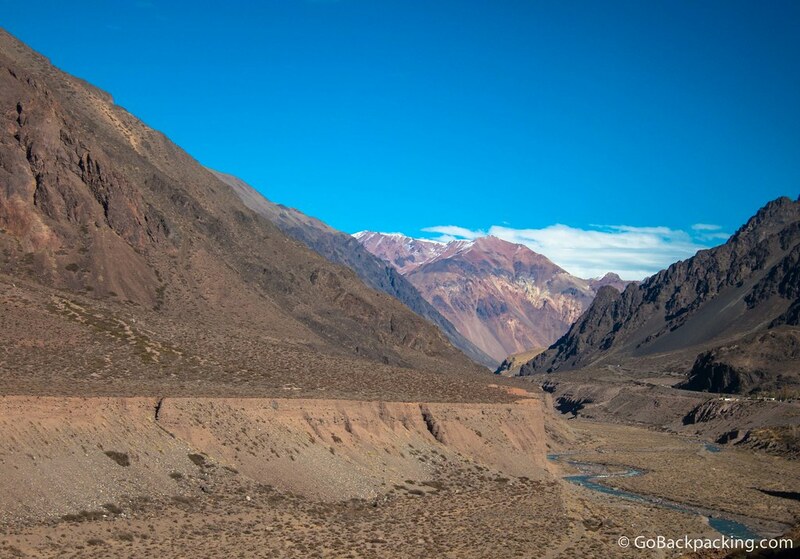 On the tour, we also stopped along the highway to get a glimpse of Aconcagua. Can you please tell me what this pass is called and if we would have altitude sickness problems? We are traveling from Brazil so would we stop a night in Mandoza or travel from Buenos Aries? 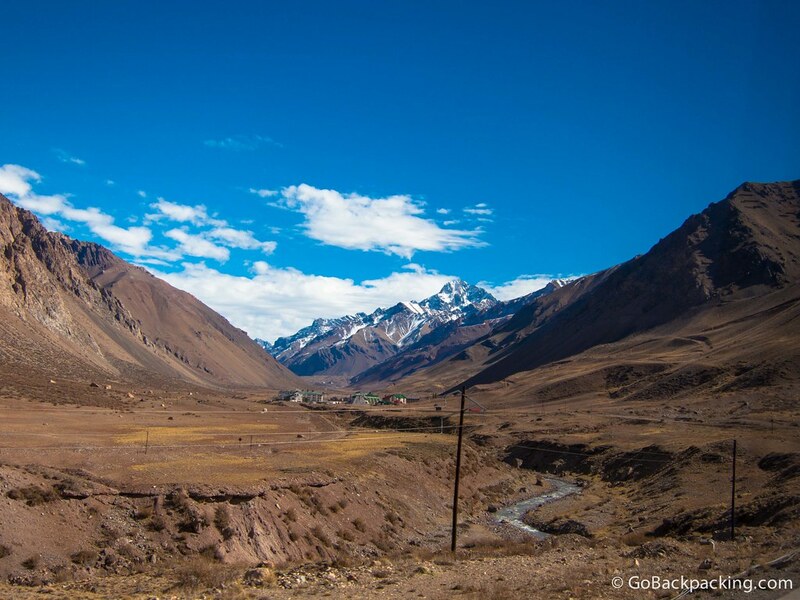 I’m not sure what the pass is called, but it’s unlikely you’ll experience altitude sickness because you’ll be traveling by bus and won’t be at the higher altitudes for very long. I traveled via bus from Buenos Aires > Rosario > Cordoba > Mendoza > Santiago and enjoyed it. Well, there wasn’t much to see in Rosario so I could’ve skipped that city, but I liked spending a few days in Cordoba and and Mendoza on my way to Santiago. 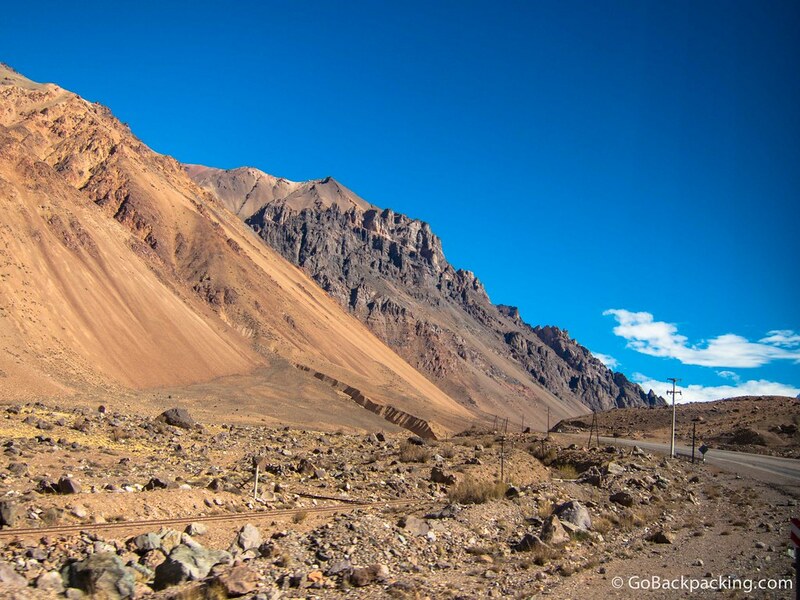 The scenery between Buenos Aires and Mendoza was nothing special. Slightly strange but practical question — Can you let me know if there are any toilet break stops along the way! Also, do the windows open on the coach? The only break I recall was when we were crossing the border. I believe snacks were served on the bus, and it was equipped with a bathroom, but I can’t recall 100% for sure. 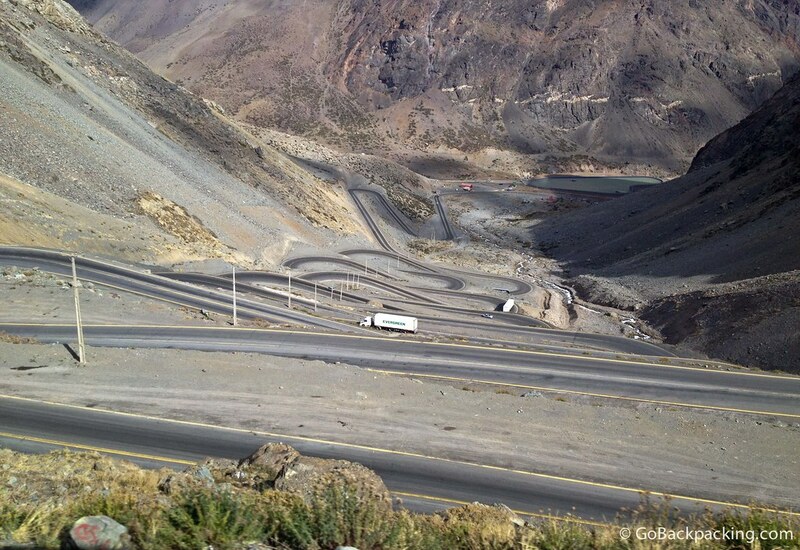 We are thinking of doing the same route but the opposite direction, Santiago to Mendoza. Just curious, if there are no breaks other than the border crossing, is there a change of driver somewhere along the route? This trip is currently showing as 11.5 hours online, so rather a long haul for one driver. I think the pass may be closed in Winter due to the amount of snow they get. It’d be quite dangerous. You’d probably have to fly. 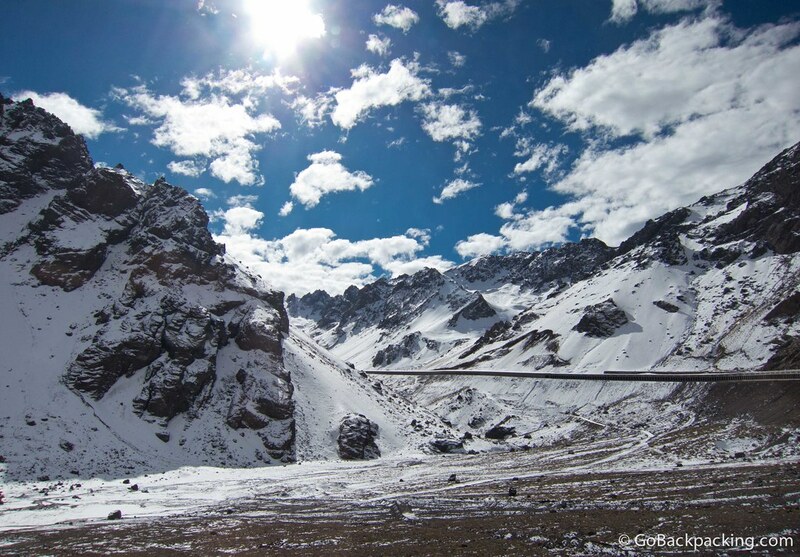 You can make the trip in the winter, although the road is often closed due to snow. If you have time to wait a day or 2 the bus is a good option. If not your only other option is an expensive plane ride. I’m planning to catch the bus from Santiago to Mendoza in November and on the return journey, need to be back in Santiago by Friday, 25th November to catch the flight home. I have been told that the bus schedule isn’t published until 4-6 weeks before departure. Do you know if generally there are buses on this route every day and are there any overnight buses?